Bergen, Norway is a pleasant seaside town best known for its iconic row of colorful buildings perched on the edge of a picturesque harbor. The city is the gateway to the majestic Norwegian fjords and to some of the most beautiful and adventurous natural landscapes you’ll ever see. But Bergen is also the rainiest city in Europe, so there is a good chance if you spend 3 days in Bergen, your itinerary will include at least one rainy day. Don’t let the possibility of rain in Bergen, Norway scare you away. Despite the tendency for wet weather, you’ll still have a great time exploring all the city has to offer. Bergen in the rain is just as magical as it is when it’s sunny! We spent 3 days in Bergen at the end of a two-week Scandinavian trip. Our trip took us from Copenhagen up the West Sweden coast to Oslo, Norway and through the brilliant Norwegian fjords. Eventually we arrived in Bergen by train from Flåm. Our trip started out with beautiful warmer-than-seasonal weather in other parts of Scandinavia, but in true Bergen fashion, it rained nearly the entire time we were there. We weren’t necessarily disappointed by the rain, as it should be expected. It rains in Bergen anywhere between 235-270 days each year. That’s at least ⅔ of the year that you can expect showers! We made the best of our visit to the rainiest city in Europe. We put on our raincoats, borrowed an umbrella from the hotel, and headed out in the rain to enjoy the top sites in Bergen. Our 3-day Bergen itinerary is great for rain, shine, or snow. It hits the top tourist sites in Bergen, which you can easily see in 1, 2, or 3 days in Bergen, Norway depending on how much time you have and how slow you like to travel. We tend to stay a day or so longer than most travel sites recommend simply because when you travel with kids, downtime is always a must. It allows us to enjoy the sites without feeling rushed. 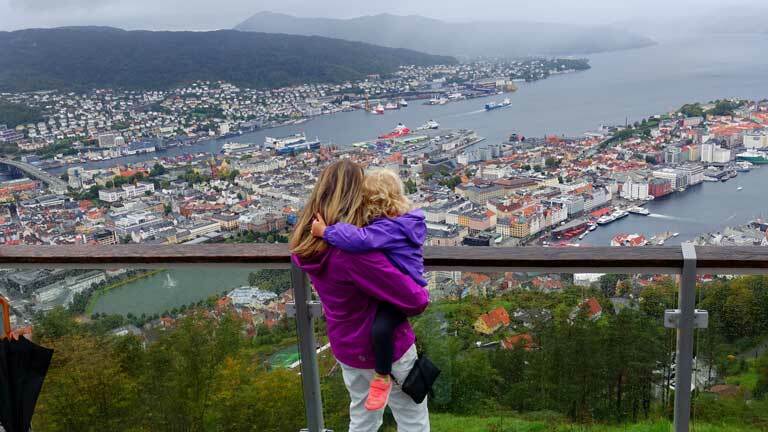 3 days in Bergen is the perfect amount of time when traveling with kids. As I mentioned earlier, Bergen is the rainiest place in Europe, so expect rain and pack for it. If you luck out and get 3 days in Bergen of sunshine, even better! But it’s better to be prepared. 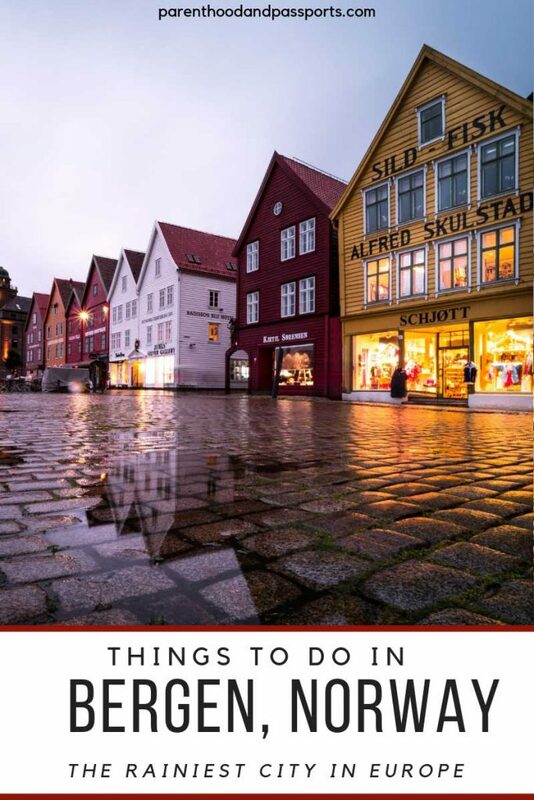 Before we get into our 3-day Bergen itinerary and all the great things to do in Bergen, here are a few must-have items if visiting Bergen in the rain. Waterproof crossbody bag for cash, passports, etc. 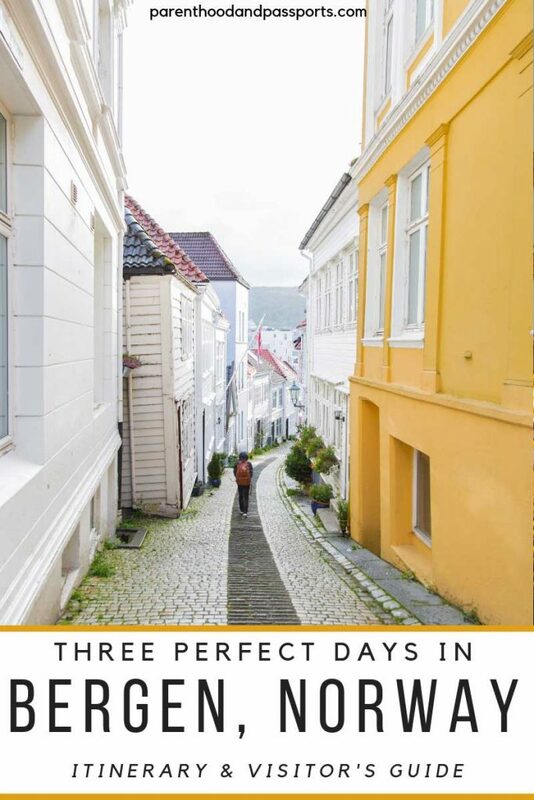 Although our suggested itinerary allows for 3 days in Bergen, you could easily combined day two and three of the itinerary below and shave a day off of your own Bergen itinerary if you have less time to spend or prefer to allocate more time elsewhere in Norway. With Bergen being such a rainy city, it’s no surprise that there are a lot of indoor activities in Bergen. It is the shopping hub of western Norway, so you will find several large indoor shopping malls where you could easily spend a rainy afternoon. 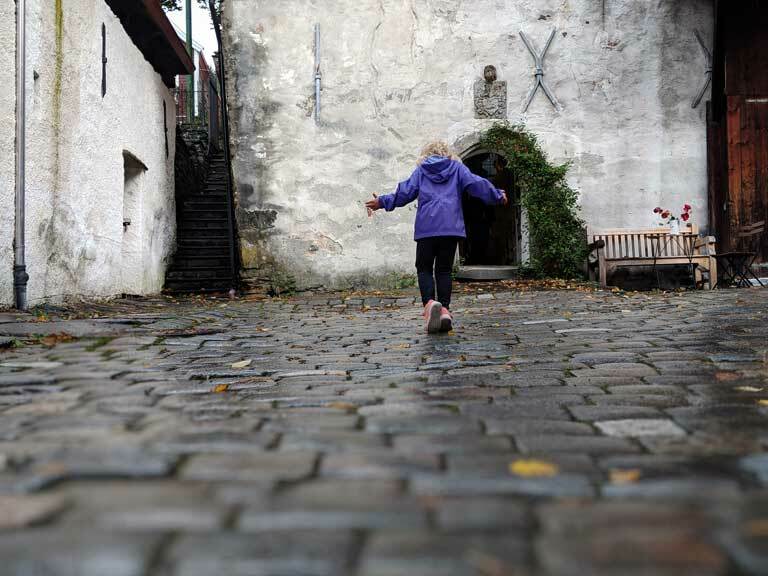 But if shopping isn’t your thing (it isn’t mine either) then grab an umbrella and enjoy these outdoor activities in Bergen that will keep you surprisingly dry. Bergen is surrounded by seven mountain peaks, the highest of which is Mount Ulriken. If you want to see stunning views of the town, harbor, sea and fjords just take the Ulriken cable car to the top of the tallest peak. You can enjoy lunch or dinner at the mountain restaurant or even zipline from the top, if the weather permits. There is a bus that runs every 30 minutes to the cable car’s starting point, so you can easy get there by public transportation. 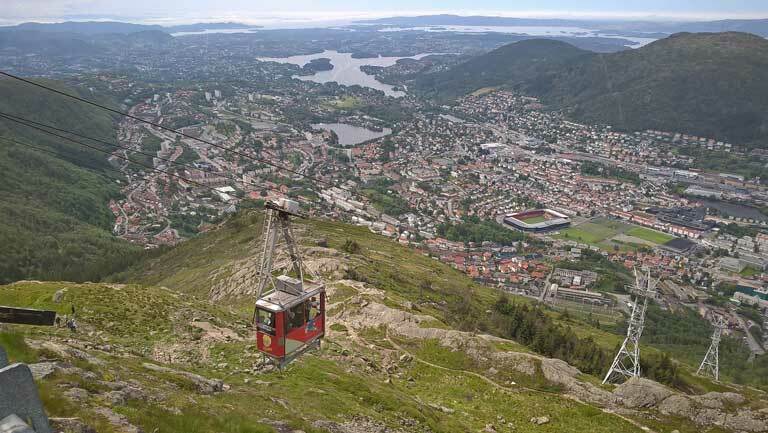 If you have a day in Bergen without rain, a popular hike takes you from Ulriken cable car to the Fløibanen funicular. It’s roughly 9 miles and can take a minimum of 5 hours, but offers beautiful views. 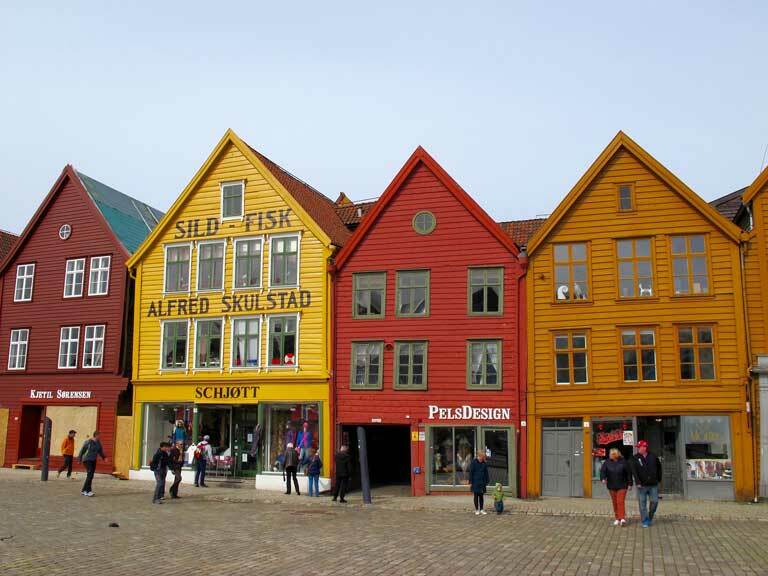 Perhaps the most photographed area of Bergen, Bryggen is primarily known for its row of colorful old buildings that line the harbor. The area is a great place to duck into stores or shops on a rainy day. This UNESCO World Heritage Site has actually burned almost completely down several times but has been rebuilt using the same type of building materials and methods used in the 14th and 15th centuries to preserve the historic character of the wooden buildings in the warff. There are several narrow alleyways and passages within Bryggen that are fun to explore. Exploring Bryggen should be apart of any Bergen itinerary. Stave churches are to Norway what do are to Italy. They are beautiful, old, and elaborate in their own unique wooden way. 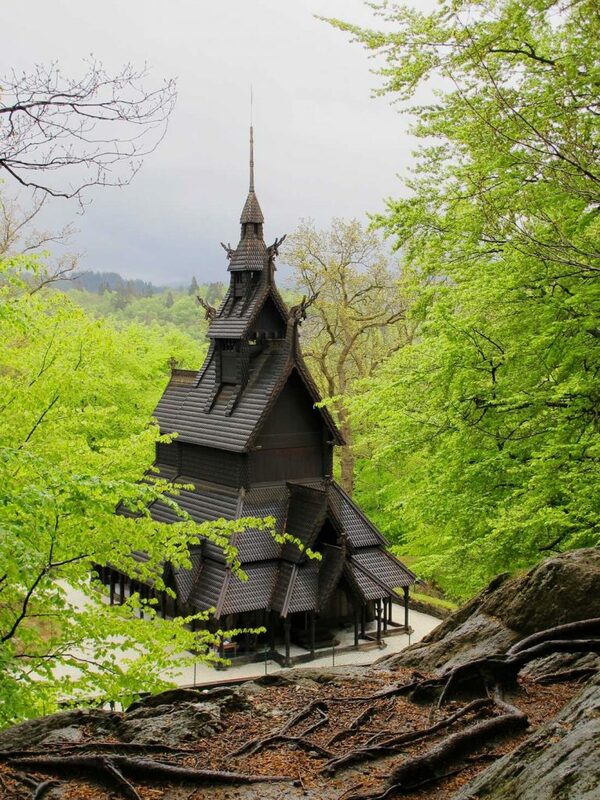 You can find numerous stave churches throughout Norway including in Oslo and near Flåm. The Fantoft Stave Church had to be entirely rebuilt in the 1990s because an arsonist burned down the original historic church. The church has been rebuilt to look exactly as it originally did. You’ll have to take the light rail to Fantoft, which takes about 20 minutes. There is also a short 15 minute hike to get to the church, so while it isn’t an ideal rainy day activity in Bergen, it is well worth seeing. The Fløibanen funicular railway is another popular outdoor attraction in Bergen. The railway takes you up Mount Fløyen for even more stunning views of Bergen. 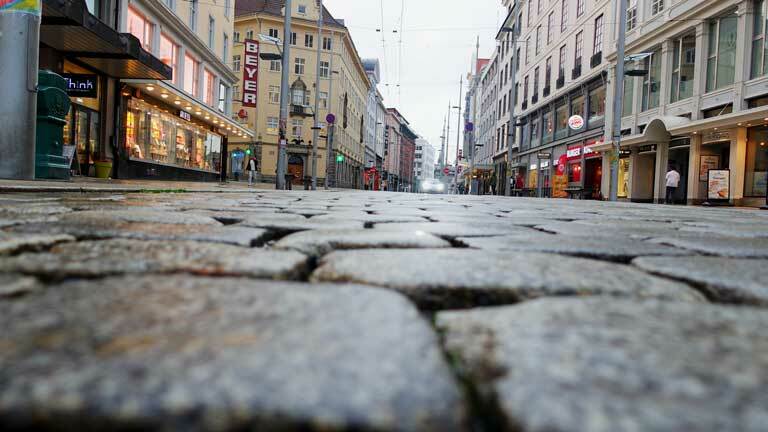 It is a great activity even in the rain, and is conveniently located right next to Bryggen and close to the city center. We sat inside the small cafe at the top of the mountain and had hot chocolate while we waited for the rain to let up a little. We found in Bergen the rain would come down heavy at times but then you’d have moments where the rain stopped and it was just cloudy. So we waited out a brief heavy shower and then proceeded to take a few scenic photos looking out over Bergen. If your trip to Norway does not include a visit to Flåm and the famous Nærøyfjord, then your next best option would be to take a short fjord tour around Bergen. The fjords are the biggest attraction in Norway, if not all of Scandinavia. They are breathtaking to say the least. 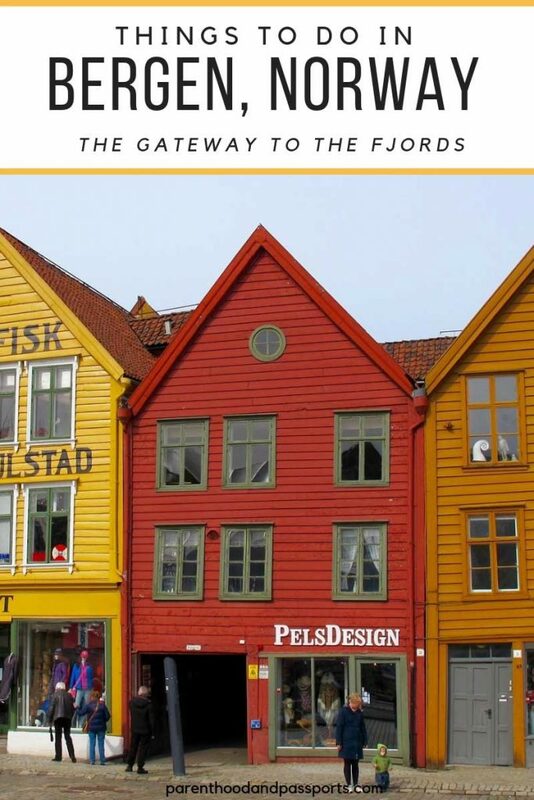 You can take a fjord tour to Flåm and back to Bergen in one day, or if your time is limited, you can take a shorter fjord cruise to Mostraumen or simply relax on a sightseeing boat and experience the Puddefjord and Bergen from the water. The Bergen fish market is a great place to have lunch or dinner and people watch. Fresh fish, oysters, and other seafood are caught and brought directly to the market to sell or cook up for those who wish to dine there. 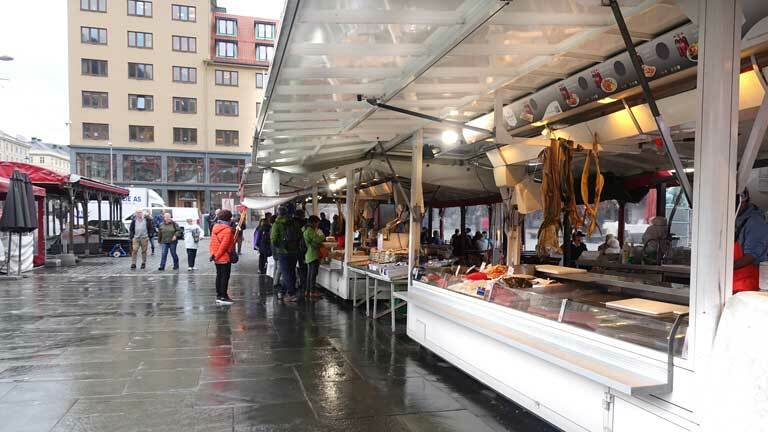 The seating area at the fish market is covered so even when there is rain in Bergen, you’ll be able to stay dry while you enjoy your meal. We had some of the best oysters we had ever eaten at the fish market in Bergen. I’d guess they came fresh from the sea that day. The fish market is one of the best places to eat in Bergen. Because Bergen attracts a lot of tourists from all around the world, there is no shortage of lodging options in the city. We stayed at Hotel Oleana. The hotel is centrally located and has a modern, edgy feel to it. It is in walking distance to the train station, Bryggen, and a lot of great restaurants and shopping centers. The hotel offered a robust, complimentary breakfast which kept us feeling full most of the day. You can find lodging in Bergen in all price ranges, from budget hostels to luxury accommodations. 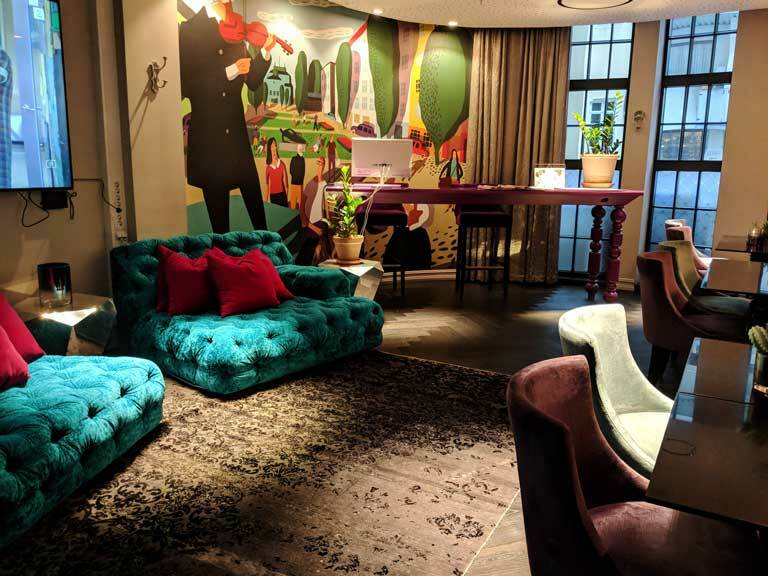 So it Hotel Oleana doesn’t suit your needs or budget, there are plenty of other options in Bergen. Regardless of the season, Bergen is beautiful town to visit. On sunny days in summer it is bustling with activity. But Bergen is equally charming when it’s raining and has almost a mystical feel on a cloudy day. In winter, when the surrounding mountains are covered with a dusting of snow, Bergen looks like a winter wonderland with its colorful buildings set against the snow-capped mountains and hills. For families traveling with children Bergen may just remind them of Arendelle, the mythical town in Disney’s Frozen. Rumor has it, the movie’s setting was inspired by this magical Norwegian city. And while you won’t find Elsa and Anna in Bergen, you may just feel like a Disney princess yourself when you are walking through the picture-perfect streets. Have you been to Bergen, Norway? What would you add to this Bergen itinerary? Leave your thoughts in the comments below. Gorgeous! I would love to visit Norway. It’s sitting next to the other Scandinavian counties near the top of my bucket list! Bergen was such a cute city! I think we were there on one of the few rain-less days. The fjords are so gorgeous! Good advice on what to pack too. I’m jealous! Sounds like you went at the perfect time. And I agree, the fjords are stunning! Lovely! I’ve been wanting to visit Norway this year would be ideal. I would definitely visit Bergen first it just so charming!